Our traditional style – 2″ fabric is inserted between the t-shirt blocks with alternating corner blocks of a coordinating color fabric. We use the finest quality (quilter’s grade) 100% cotton fabric for all our sashing and backing. You can request a particular color for this or you can let US choose for you taking in consideration the t-shirts you have supplied. Graphics for this style need to be 15″ or less. 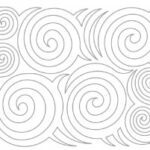 Quilting pattern used on all traditional quilts! *If more than one graphic is combined to make a block or shirts need to be stitched (ie., button up jerseys, dress shirts, v necks, or to build a block up to size) a $8.50 fee will be charged per block. 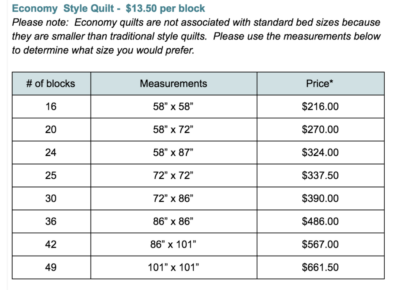 We can only accept a MAXIMUM OF 5 SHIRTS per quilt that need to be pieced. We now are offering an extra small size of 12 blocks for our traditional and framed styles. With this size we require an additional border to be put around it (+$55). The size turns out to be approx. 60" x 74". The base price of the 12 block is $249 (includes border). Any additional piecing or options would be extra. Our framed style – A 1″ dark frame is sewn around each block. Because of this, the graphics are cut smaller (12″). Then a 2″ fabric sashing is inserted between the t-shirt blocks with a matching corner block. We use the finest quality (quilter’s grade) 100% cotton fabric for all our sashing and backing. You can request a particular color for this or you can let US choose for you taking in consideration the t-shirts you have supplied. Graphics for this style need to be 12″ or less. Our economy style does not have fabric inserted between the blocks which makes the quit a little smaller in size. We also use a different quilt pattern on the economy style. Quilting Pattern used on all economy quilts. 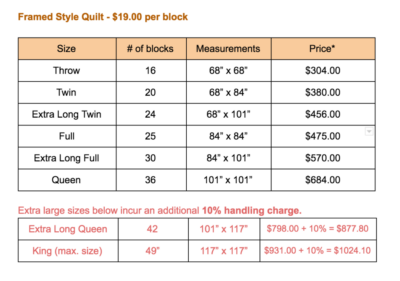 *If more than one graphic is combined to make a block or shirts need to be stitched (ie., button up jerseys, dress shirts, v necks, or to build a block up to size) a minimum of $8.50 fee will be charged per block. 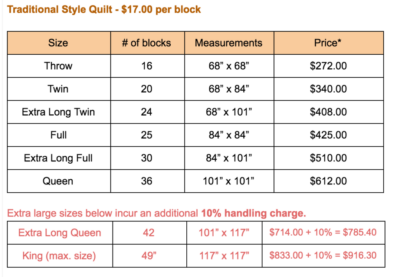 We can only accept a MAXIMUM OF 5 SHIRTS per quilt that need to be pieced.
" I am SPEECHLESS! I absolutely LOVE it! " I just wanted to let you know that I received my quilt today and I am SPEECHLESS! I absolutely LOVE it! The color of fabric you chose between the squares is perfect! 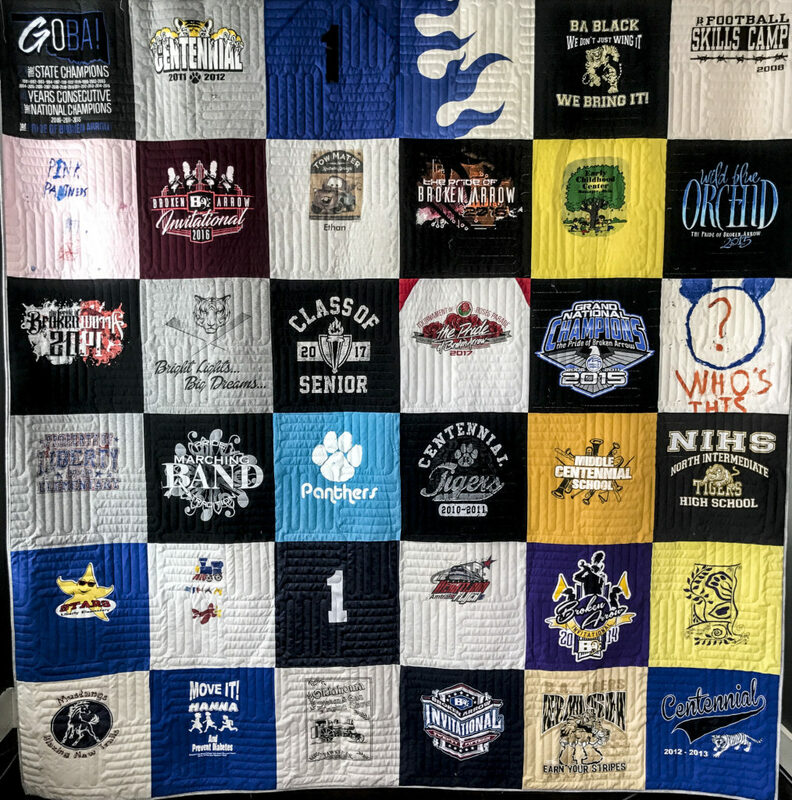 You have no idea how much this quilt means to me/us, as this was made from clothing items (ski t-shirts) from my Dad who passed of Pancreatic cancer. The quilt is for my son (it’s a surprise) who used to ski with him often. The photo square of the two of them made the quilt even more special. I know you do hundreds of quilts, but I just want you to know this is THE PERFECT quilt to memorialize my Dad and I can’t wait to give it to my son (he’s a 34 yr old San Francisco fireman) on his birthday, I know it will touch his heart as it has ours. Thank you Linda, you and your quilting team are absolutely FABULOUS! Thank you again for the excellent quality and craftsmanship! Sorry it took so long to write this. Just wanted to take a moment and say how fantastic your work is! It is even better than I imagined. As a lifelong comic book fan and collector, I was really excited to try something new with my recycled comic book t-shirts - and this was just stunning! This quilt is a beautiful piece of comic book art, securely and professionally pieced and stitched by your high standards. I can't help but stop and look at it every time I pass it now lol I have shown all of my family and friends, shared photos. Everyone loves your work! I also wanted to ask if you might want to use some of my photos on your website? I just think it's one of the most colorful and vibrant quilts I have ever seen.
" The quilt is magnificent "
The quilt is magnificent. Originally I thought I was going a bit crazy ordering what I thought was an extremely expensive item; now between tears I thank you for creating something that will memorialize my husband for future generations. Originally I thought I might be able to design the layout but I can only thank God that I put it entirely in your hands. I cannot imagine the amount of time it took to do such a balanced layout. The meticulous detail in every inch of the quilt is amazing. The placement of my husband's name with rank and department shield is perfect. I had planned on giving this to my son for my grandsons but know I need to keep it for awhile. It brings back so many cherished memories of the many years we spent together. Please extend to every member of your staff my appreciation for a job done to perfection. You all will always be in my prayers. Thank you truly for the amazing gift of comfort you have provided.
" You (your company) did a wonderful job and it so exceeded my expectations. " Our quilt arrived and it took my breath away! You (your company) did a wonderful job and it so exceeded my expectations. I really didn’t know what to expect exactly but I was a bit nervous. But we are soooo happy with it that we have already told a number of people about it and are showing it off every chance we get. Thank you so much for your great work! It will preserve so many memories for us and make us smile every time we look at it.
" couldn’t be more happy with it "
... received the quilt a few weeks ago. I just wanted to let you know it turned out WONDERFUL, i couldn’t be more happy with it. Wish I could give it to my mom now, but I must be patient for Christmas. I apologize it took me so long to let you know.Thanks again and have a great day!
" You have far exceeded my expectations! " You have far exceeded my expectations! 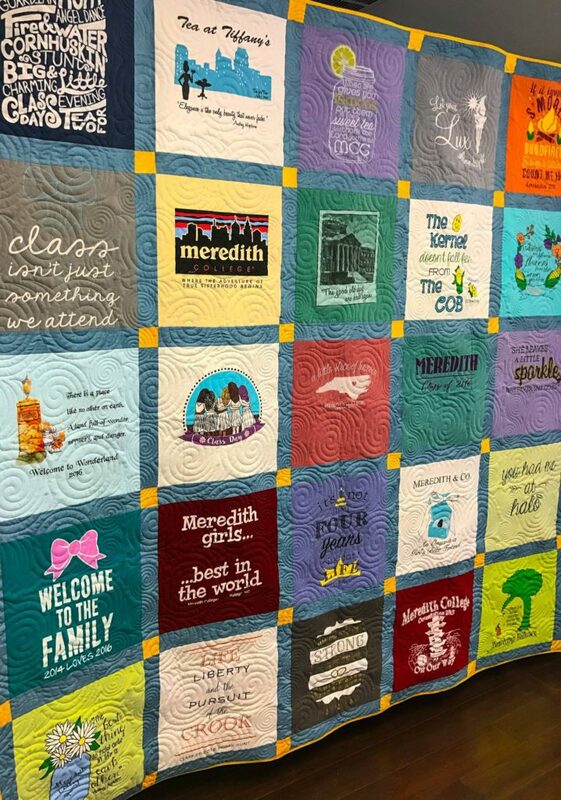 I am not a big fan of quilts but to have one that tells a part of my story is something very special. I sent you 16 old race T shirts, that I didn't even wear and you have created something that looks amazing and I will actually use! Thank you!!
" The Gaston Day School Quilt was incredible! " " So professional, so perfect….absolutely incredible." OMG this was amazing! I love, love, love it! So professional, so perfect….absolutely incredible. I’m never 100% sure when it comes to the Internet. I just took a chance and I couldn’t be happier. I have another box of t-shirts ready to get on its way to you. Just….WOW. Thank you so much! I’m telling all my friends. I’ve already showed everyone! I know of 3 more coming your way after seeing mine. Kudos to you! "…he was blown away and thought it was the coolest gift ever! " Thanks for a well-made, lifelong gift. You guys did an amazing job with it!!
" 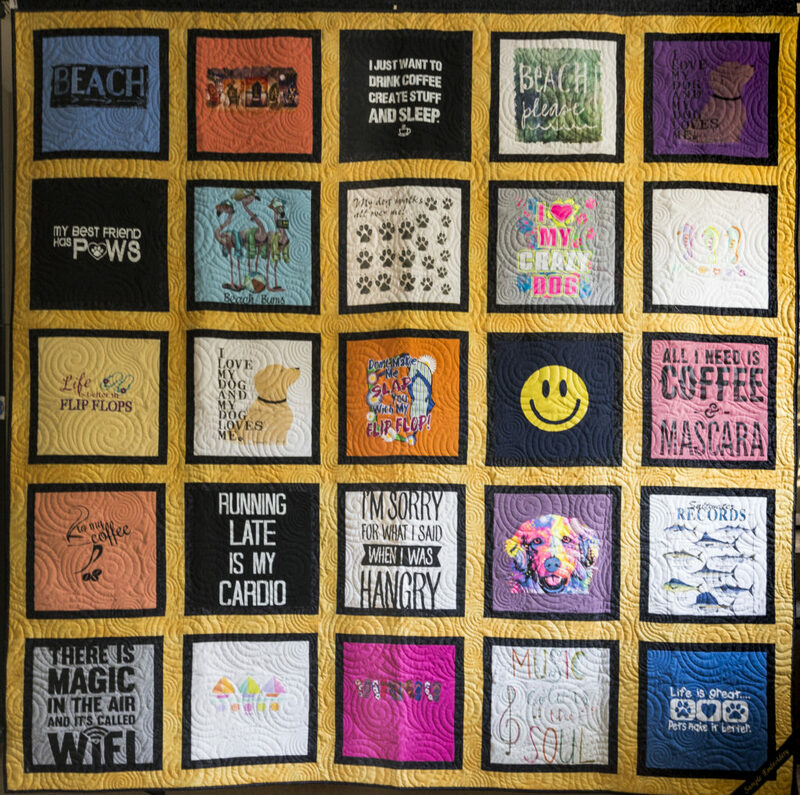 I received my quilts and they are amazing "
I received my quilts and they are amazing. Thank you so much for all of your hard work! All of my friends love them and you will probably be getting some from friends and family of mine soon!
" We were so delighted to see the finished product "
" I can’t thank you enough! " " You do excellent work, worth the money in every way. " I coached summer swim for 15 years. I was sad to give it up, so many great memories. I sent my coaching shirts to you along with team tee shirts and had no idea what to expect. When I opened the box I was taken aback by the beautiful work. The quilt is so incredible. The layout of the shirts and the colors you chose along with the border color are remarkable. I never expected the quilt to be so amazing. The quality of the workmanship is perfect. You do excellent work, worth the money in every way.